The success of devaluation in improving the balance of trade, and through it the balance of payments, depends upon the demand elasticities of imports and exports of the devaluing country, In other words, an improvement in the balance of trade will depend upon whether the demand for imports and exports is elastic or inelastic. Devaluation makes the imports of the devaluing country costlier than before and in case her demand for imports is inelastic, a higher amount will he spent for the same imp’ L~, thereby worsening her balance of trade. Similarly. if her export demand is inelastic. then. after devaluation, lesser amount will be spent by the foreigners thereby affecting adversely the balance of payments of the devaluing country. However, if her demand for exports is elastic then with a fall in the prices of the exports as a result of devaluation. more will be purchased by the foreigners, which. in turn, will help in stropping the equilibrium in her balance of payments. Likewise. if her demand for imports is elastic. then the imports of the country will he significantly reduced by evaluation. which in turn would improve the balance of payments of the devaluing country. However, some rule is needed relate the required degrees of elasticity for the success of devaluation in improving the Balfour of trade. In this connection we have what arc called the.According it. devaluation will improve the balance of trade of a country if the of the elasticity of demand fur imports and exports is greater than one. When the sum off these elasticity is equal to one’ devaluation will leave the size of the deficit unchanged; and when this is less than one, it will make – the balance of payments worse than before. It should he noted here that the Mm shall-Carnal conditions relate only to the demand for commodity exports and imports. The response.of capital both. payments of a country). Then if sufficient amounts of autonomous capital low into the devaluing country, it would be possible to have the sum of elasticities of demand less than one and yet devaluation may lead to an improvement in the balance of payments of the devaluing country If the country has investment opportunities and the devaluation is sufficient to allay fears of further devaluation, then capital will fettuccine to flow into the country in search of profits. On the other hand, if the flow of capital is reduced, as a result of devaluation, then the devaluation even with the sum of the elasticizes greater than one, will aggravate the deficit. This would occur, if capital were discouraged by devaluation and investors fear further devaluation. will not make any impact on the imports or exports (If the devaluing country, even though her demand of imports and exports may be clastic, (I’) Finally, there is the method of exchange control. We know that deflation is dangerous depreciation has a temporary effect and may provoke others also to depreciate: and devaluation hits the prestige of a country. These methods are. therefore, avoided and, instead, foreign exchange is controlled by the government. All the exporters are ordered to surrender their foreign exchange to the central bank, and ill is then rationed quit among the licensed importers. None else is allowed 10 import goods without a licence. 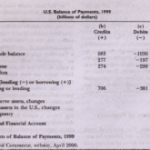 The balance of payments is thus rectified by keeping the within limits. (Exchange control is discussed.